This article is being written on the technical preview of Windows 10. It is impressive and exciting to see a real improvement aimed at desktop productivity. My motivation for reviewing Windows 10 on one of my Virtual Machine (VM) servers is to understand the future of Microsoft Windows Apps. Out of the gate, Windows 10 addresses my primary concerns. 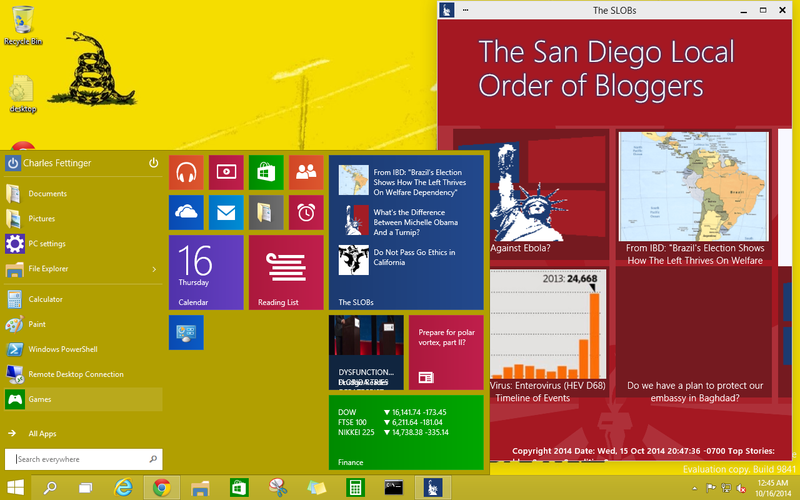 Apps tiles are now wonderfully integrated into the classic Windows Start button. The future of Windows apps looks bright. This new apps interface is terrific and a huge improvement over Windows 8 or Windows 8.1. Windows apps now use their inherent responsive design model to resize throughout the desktop environment. The Windows 8 style "screen corners" command have changed. That took a moment to figure out. In their place comes a more classically intuitive drop down list of commands. The "screen corner" commands will likely return on touchscreen devices, but it is clear this new version of Windows is designed for productivity and enterprise users. 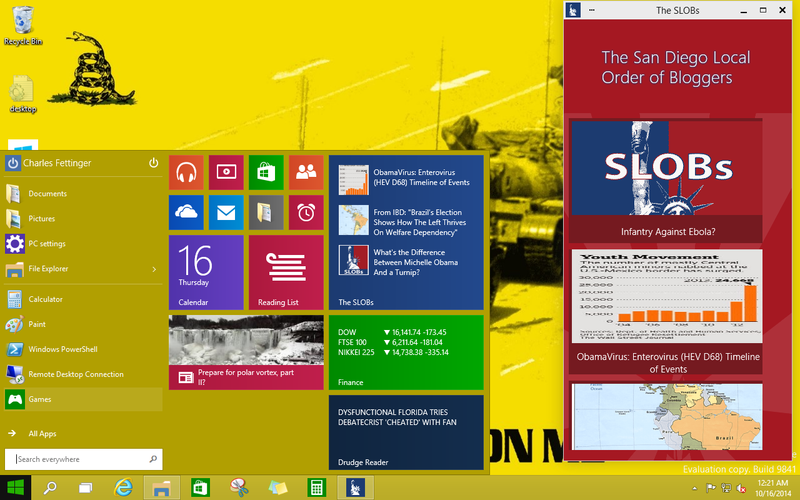 The new start menu allows users to switch back to the Windows 8.1 style Start Screen interface. However, the integration of dynamic information from app tiles and the classic Start Menu is great. I am going back to playing with this new toy. 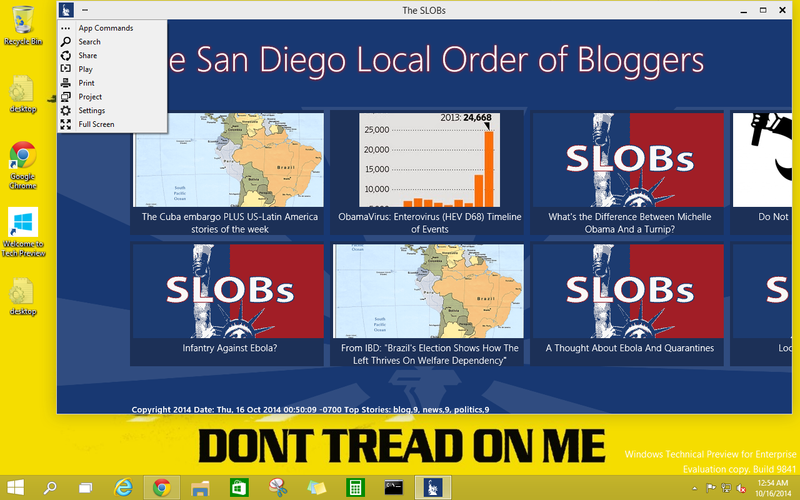 So, here is a plug for my fellow San Diego Local Order of Bloggers' Windows App. Go download it. We are constantly adding new functionality. You may also notice, this article was written in Chrome to see if it was compatible. It is. Richard Jayston, a 27 year old music columnist for Rockfeedback.com, remarks: "Things that will be that great are never going to vanish. Early music from resep masakan, cipto junaedy tips membeli banyak properti, info terbaru cipto junaedy, cipto junaedy official, news cipto junaedy, cipto junaedy guru properti, cipto junaedy ebook, mitra seo info, forties soul to the sixties spirit, was simply so great. It has impacted everything thusly at any rate so it is just characteristic that children begin turning back to the foundations of this impact. It is similar to the garments - individuals need to wear jasa review, jasa seo, panduan seo newbie, sensualitas wanita, internet marketing viral, guru cipto junaedy, cipto junaedy kaskus, cipto junaedy, profile cipto junaedy, cipto junaedy ebook, strategi cipto junaedy what their guardians wore for one reason - in light of the fact that individuals need what's great!" This is very informative blog...Thanks for sharing with us. I have also avail information about the best new project Godrej Prime Chembur. During M&A when a seller wants greater control over who sees what and when, with greater visibility over potential buyer behavior in the data room, it pays to invest in a virtual data room built with the specific M&A process in mind. Honestly, this software doesn’t turn the Windows or Mac operating system in Android but it uses a virtual Window over Windows to run Android on your PC and you can anytime navigate between Windows and Android. So, whenever you open Blue stacks App Player on your PC, it will let you experience full Android environment.